Thud, thud, thud. The titans will not be dissuaded from falling in one of the 15 best PC first-person shooters around. Respawn’s second-ever DLC release for their ground-averse FPS will be named Frontier’s Edge, and will take us to the most remote corners of its thinly-sketched universe. The second of three map packs included in Titanfall’s £19.99 / $24.99 season pass or sold individually for £7.99 / $9.99, Frontier’s Edge constitutes three new settings for parkour-enhanced warfare. 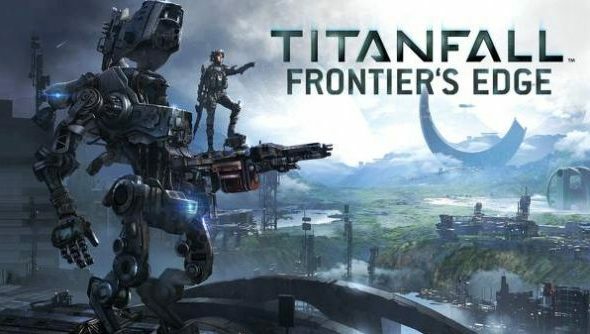 Titanfall has made a habit of plonking us in industrial facilities which look like holiday destinations, and after the abstract indoors arena of its War Games DLC map, Frontier’s Edge marks a return to that theme. Dig Site will be set in and around an isolated mining outpost, and Export on the side of a mountain hollowed out by corporations. And if the exclusive beach resort of Haven sounds untouched, it won’t be for long. There’s no release date forthcoming yet. In the meantime, have you ever wondered what it’s like to cheat at Titanfall?